Among the many exciting breakthroughs made possible by the Internet, citizen journalism is one of the most inspiring. It creates a world in which everyone can be a broadcaster or publisher, regardless of talent, aptitude, possession of facts or any self-awareness at all. This is all made possible by one single advance: the removal of expensive and pernickety sub-editors from the process. Sub-editors are the latest victims of a gradual diminution in the variety of skills once thought necessary to journalism. A trainee reporter 40yrs ago would have had to produce material good enough in different ways to satisfy at least five pairs of eyes: those of the line manager (news or features editor), of the sub, of the production editor, of the editor and, not least, of the typesetter who would have regarded his (it was invariably ‘his’) interference as essential. Now, in the era of citizen journalism, none of those is necessary. Material can be published immediately, with no regard to its factual accuracy, legality, sense, honesty, spelling or grammar. As a result almost nothing you read on the Internet can be trusted. A generation of sceptics will grow to maturity in the online era. By a quirk of irony, scepticism is one of the first requirements of a journalist. 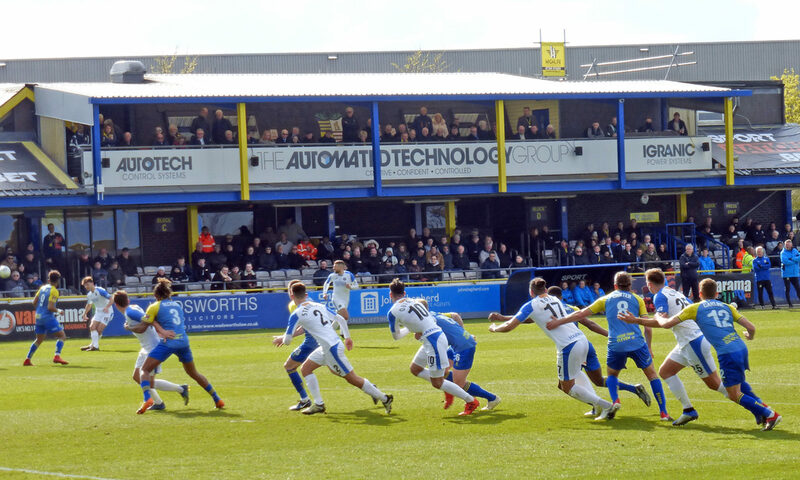 Be honest: when you first saw the name Solihull Moors on a screen, didn’t you assume it was another typically carefree piece of online editing? Surely ‘Motors’ was intended. In the West Midlands, Solihull Motors made a lot more sense than Solihull Moors, there being neither wuthering uplands nor wandering Berbers in the vicinity. Yes, Solihull Motors must be a former company team, like PSV Eindhoven or Bayer Leverkusen. 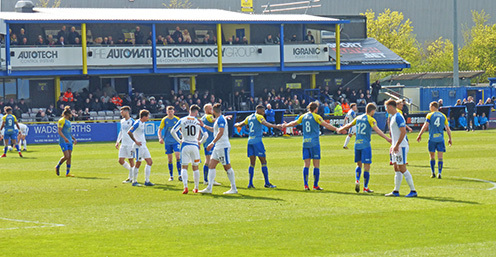 It was the occasional presence in the Oldham attack of the great Matt Smith, hero of an FA Cup win over Liverpool in 2013, that brought Solihull’s football team to my wavering attention. Athletic had plucked Smith from the Moors or Motors, as I continued to think of them, then in the sixth-tier Conference North. In fact Solihull Moors is too young a club to have any links with prominent centres of motor manufacture. A young fan would be as confused by Motors as I was by Moors. The club was formed in 2007 by the merger of Solihull Borough and Moor Green. Moor Green was the older club, originating in Hall Green, south-west of Birmingham. Solihull Borough had originally played under the name Lincoln FC. Moors, then, is not the most confusing name that might have been attached to the club. The Moors play at Damson Parkway, about midway between Solihull and Junction 6 of the M42. ‘Motors’ would still be appropriate: the ground is surrounded by Jaguar Land Rover premises. And at Junction 6 you’ll find the National Motorcycle Museum). 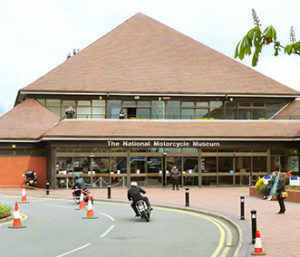 My first reaction to the National Motorcycle Museum was to feel physically ill. The evocative smell of burned oil and the gleam of polished chromium sent me hurtling down Housman’s “happy highways where I went and cannot come again”. To have owned a Triumph T20 Tiger Cub and, like a fickle lover, to have casually dropped it on the acquisition of a full driving licence… the sight of all the wonderful machines I might have graduated on to was deeply upsetting. An AJS took me back almost 50 years to the temptations of a dealer at Rayners Lane; a Norton reminded me of a test-ride in St Albans, where I was only just strong enough to keep the bike upright at a red traffic light. All around me, middle-aged men in leathers were welling up. Eventually, by looking not at the bikes I had loved and lost but at the museum as a series of collections, I calmed down. Second impressions, then. As I approached the museum a number of bikes were sweeping around a modest circuit coned out in the car-park. The sound suited the setting but the speed must have been frustrating for the riders. Within, the museum’s antechambers have the atmosphere of a high-class golf course club-house, but with highly-polished and scrupulously dusted motor vehicles where you might expect trophy cabinets. There are five big galleries in which motorcycles (and related vehicles) are lined up by age, by manufacturer and in some cases by purpose. It’s an overwhelming prospect at first – 850 or more bikes, beautifully restored and/or maintained, in rank upon rank. Every one of them looks as though you could ride it out of there, pick up Marianne Faithful and head off to New Orleans. Mostly, the National Motorcycle Museum is about ogling beautiful engineering and lamenting lost youth. But it’s also educational: who knew that Triumph was founded by German immigrants called Siegfried Bettmann and Mauritz Schulte; that Steve McQueen was among the pursuing Wehrmacht riders as a stuntman failed to jump the wire in The Great Escape? 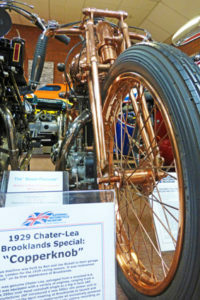 And there are curiosities: a machine and banjo used in the 1935 George Formby film No Limit; the 1929 Chater-Lea ‘Copperknob’, on which the copper-plating looks as though a plumber built it. Upstairs, the restaurant is worth a visit. If the museum premises suggest a club-house, the restaurant plunges to the opposite extreme by summoning up the spirit of the transport caff. Outside the window, the dual-carriageway A45 stands in for the motorways beside which such services once fed a nation. The most obviously old building is the 15th century Manor House). A plaque confirms that it dates from 1495. Now occupied on a Saturday morning by a number of small craft businesses, it is open to anyone to wander in. Further along the intermittently decorative High Street is a 16th century building, but here you’d have to feign an interest in fashion to look inside. Off the High Street, Mell Square with its carousel and coffee house has something almost Parisian in its atmosphere. But this is clutching at straws. Not having found the information centre I asked the clairvoyant I met in the Manor House what I should look at. She suggested the Church of St Alphage. At the eastern end of the High Street, this is apparently the historic core of the town. Opposite the church is the 16th century George Hotel, now a Ramada Inn, with more half-timbering than a Morris Traveller and enough leading in the windows to cage a flock of budgies. Inexplicably, the Ramada Inn’s website has no photograph of the building’s noble southern face. Instead, it focuses on characterless modern luxury. Across the triangle of pavement and roadway known as The Square is a war memorial on which the name AA Guest caught my eye. And then you’re into the Church of St Alphege, largely built between the 12th century and 1535. Alphege was an Archbishop of Canterbury who died at the hands of drunken Danish raiders in 1012. A side chapel is dedicated to St Thomas à Becket, another Archbishop of Canterbury. What either had to do with Solihull was not clear. To the left of the high altar is an unusual two-storey arrangement of chapels. The chill dimness of the Crypt Chapel of St Francis contrasts with the colour-flecked clarity of the Chantry Chapel above. Solihull’s other attractions seem to be out of doors, but without ever finding Library Square it’s difficult to be sure. Two parks to the south-west and south-east of the town are, fortunately, hard to miss. Perhaps that should be three parks. Brueton and Malvern Parks have their own names and characters but they arc towards each other and merge in the flood plain of the River Blythe. 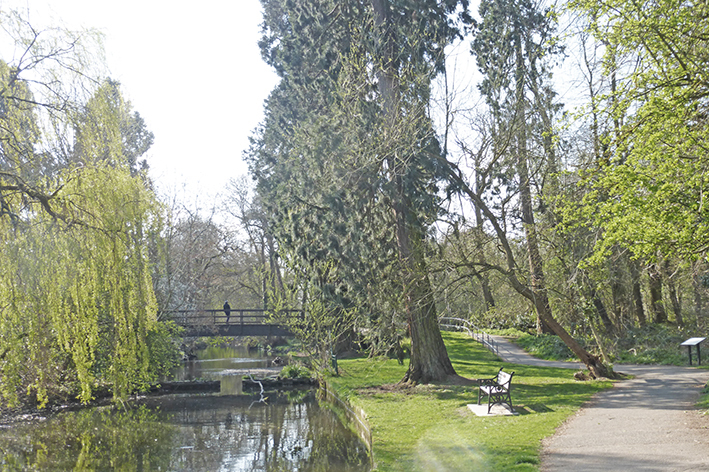 There’s water too in Tudor Grange Park, where the Alder Brook feeds a small lake. Tudor Grange also has pitch-and-putt, a cycle track, a skate-park and playground. 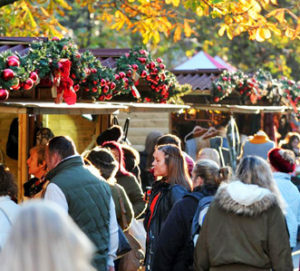 It hosts the Solihull Summer Festival and the town’s bonfire night party. A park-run had just finished as I arrived at Brueton Park. Is it harsh to wonder whether park runners are missing the point by driving to the park for their exercise? Perhaps a man who has just driven 100 miles for no better reason than to go to a football match is in no position to make disparaging remarks about leisure runners. The car-park offers a generous 3hrs free deal. Once the runners had dispersed, most of the takers were dog-walkers and most of the dogs were spaniels. Brueton is the more expansive of the twinned parks. Across the Blythe, which information boards point out flows towards the Trent from here, there’s a substantial nature reserve with different habitats and plank pathways to take you through them. Back in the park itself, around the bend towards Malvern, the variety of trees suggests an arboretum but hardly any are identified; the exception is a hawthorn dedicated to people who were killed or injured in accidents at work. The Parkridge Centre, operated by Warwickshire Wildlife Trust, has a café that opens on to a separate nature area with trails, activities and an arboretum. The Centre is surprising even down to the tiling in its toilets – a line of sculptural tiles carries the wildlife message around the smallest room. Malvern Park is more formal, with poignant memorial gates, an avenue, so far unplanted ornamental gardens and a fine statue called the Horse Tamer. But this park too has a children’s playground, tennis courts and, for no obvious reason, a small reconstruction of a medieval market hall. The football match prompted ungenerous reflections. The Mighty Moors might just be lucky or resilient enough to be promoted. Not notably superior to Havant & Waterlooville, who were relegated by the defeat, Solihull won very late on after conceding what must have been a deflatingly late equaliser. Many thanks to the Huddersfield Daily Examiner for its coverage on 3 December. 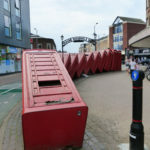 1 Dec The street art known as Out of Order, by David Mach, is on Old London Road about half a mile from where AFC Wimbledon play in Kingston. The artist proposed that the vertical box on the end be wired up so that people could use it to make phone calls. It’s on p345 of the book. 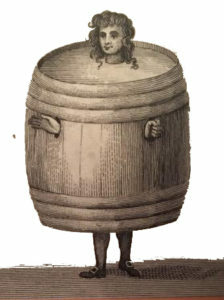 2 Dec The Newcastle ‘coat’ was a punishment for drunkards in the Stuart period – they were made to wear a barrel around the town. The temptation to push them over and see how far they’d roll must have been irresistible. It’s at the Discovery Centre, Newcastle, and on p214 of Towns of Two Halves. 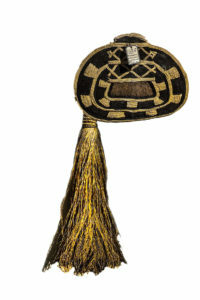 3 Dec Oxford’s Pitt Rivers Museum of anthropology and ethnology contains many charms, not least of which is the display of Tail & Buttock Ornaments. It’s an informal treasure house laid out ‘as though someone has recently returned from a distant and exotic car-boot sale and turned out the proceeds for an impromptu police inspection’. It’s on p244. 4 Dec Salvador Dali’s Mae West Lips sofa is a masterpiece of Pop Art created a quarter of a century before pop. You can see it (them?) at the Brighton Museum & Art Gallery, and much more besides. See townsof2halves.co.uk/home/services/brighton/. 5 Dec Very few are the football fans who wouldn’t have reached for the Baldwin’s Nervous Pills at one time or another. 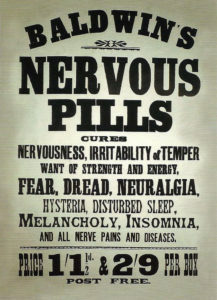 ‘Cures nervousness, irritability of temper, fear, dread, neuralgia, hysteria, disturbed sleep, melancholy, insomnia and all nerve pains and diseases,’ the advertising proclaimed. The poster in the Museum of Brands, Packaging and Advertising, on Ladbroke Grove, near QPR, dates from about 1900. You can still buy a reproduction of the poster for £7.49p – the pills themselves, 120 years ago, would have set you back less than 14p a box. P264 of the book. 6 Dec Marco the European Brown Bear came to Rotherham’s Clifton Park on a free transfer from Warwickshire County Council. “As part of the school loans service for almost 20 years, Marco must appear in the nightmares of a generation of Rotherham schoolchildren.” P276 of Towns of Two Halves. 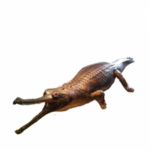 7 Dec The Swindon ‘crocodile’, probably a gharial, is one of the main attractions at Swindon Museum & Art Gallery (p317). 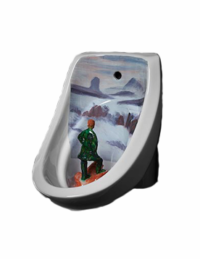 8 Dec This was to have been from Fountain 17, Hull’s homage to Marcel Duchamp as part of the City of Culture year (the picture here is Paul Collinson’s Caspar David Friedrich bowl). 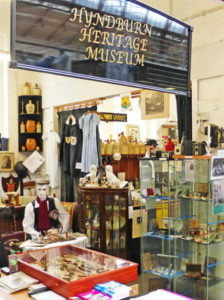 But after a short visit to Stoke, Fountain 17 closed and the exhibits were auctioned off. So the ‘window’ reveals a truly extraordinary urinal in Barnsley, fully appreciated on p21. 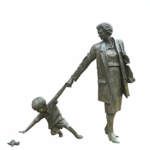 9 Dec Alan Wilson’s life-size bronze statues decorate the approach to Blackburn’s bus/train interchange. The child has dropped a teddy; grandma appears in a hurry to catch a bus. Just over 20 years old, they were re-sited as part of the 2015 Cathedral Quarter redevelopment. 10 Dec The Fan Museum, in Greenwich, has a spectacular variety of fans for the fan visiting Charlton or Millwall to admire. 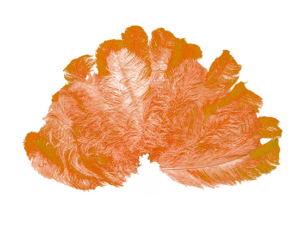 The feathered ones aren’t all associated with burlesque in the modern sense; many are Victorian, which by coincidence is how far back football fandom goes. There’s more at http://townsof2halves.co.uk/home/services/charlton/. 11 Dec The Derby Arboretum supposedly provides the model for New York City’s Central Park and was England’s first landscaped public park when it opened in 1840. There’s more on p117. 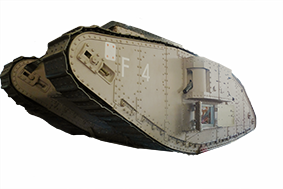 12 Dec The Lincoln engineering firm William Foster& Co built the first military tanks, of which one is on display at the Museum of Lincolnshire Life. They’re called ‘tanks’, by the way, because the prototypes were referred to as ‘water carriers’ for reasons of security: hence ‘water tanks’ and eventually ‘tanks’. Read more on pp170-171. 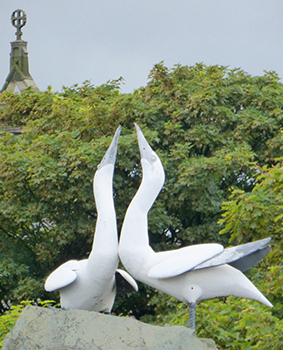 13 Dec All over Morecambe there are sculptures of birds – mainly but not exclusively seabirds – on plinths, pedestals and pillars. Many are stylised to a greater or lesser degree, some are more naturalistic, and all are great fun and an adornment to the town. 14 Dec Robert Cadman’s death in February 1740 ended the Golden Age of Flying, during which ‘flying men’ ascended high places and rapidly descended along a rope, on a grooved wooden breastplate. Cadman, from Shropshire, is honoured in the Shrewsbury chapter on p289. 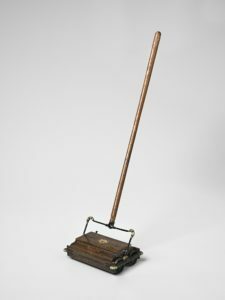 15 Dec Accrington is the home of the Ewbank carpet-sweeper, Terylene and NORI, the hardest brick in the building world. If you go, don’t miss the Tiffany display at the Haworth Gallery. 16 Dec The National Football Museum in Manchester has a fine cafeteria but how can Pukka Pies not be on the menu? More on p185. 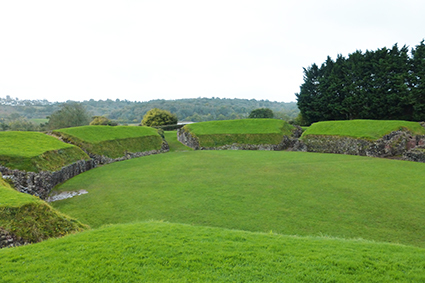 17 Dec Newport has plenty to offer on its own account, but on the outskirts is the town of Caerleon, one of the most interesting, varied and complete Roman sites in the country. Both Newport and Caerleon are in the book, from p217. 18 Dec The magnificent Musical Museum in Brentford (p44) is best enjoyed in a guided tour, culminating in a performance of the Mighty Wurlitzer. 19 Dec ‘The stones have a louche, malingering air, as though waiting for a sculptor to turn them into something recognisable.’ This is the village of Avebury, where you can wander freely among standing stones. It’s only a small diversion from a game at either of the Bristol clubs. It’s on p53 in the book. 20 Dec It used to be the National Media Museum in Bradford; now it’s the National Science & Media Museum… You might still find Tony Ray-Jones’ photographic record of an English way of life he feared would be Americanised and disappear. P39 of the book. 21 Dec There’s a gallery in Middlesbrough’s Dorman Museum devoted to H2O, and set into the floor is an interactive pond-screen. When you step on it, fish flee and water ripples. Magic. I thought I was witnessing an assisted suicide when two people pushed their friend in his wheelchair on to it. See p199. 22 Dec The Winter Gardens, Museum and Art Gallery in Sunderland is a building of many wonders, not least the recreation of a tropical rain forest amid the foliage of which dinosaurs lurk. Close by, in a smaller tank, don’t miss the real axolotl. This is all on p307 of Towns of Two Halves. 24 Dec In Huddersfield’s Art Gallery there’s a Henry Moore piece called Falling Warrior which a writer to the local paper proposed should be renamed Huddersfield Rate-Payer, according to the accompanying note. It is on p148 of the book. Happy New Year! Short of a birthday present for your football-loving other half? Throw in Towns of Two Halves, £8 +P&P from Amazon. If AFC Fylde make it into the Football League, Nailsworth (home of Forest Green Rovers) will no longer be the smallest town with such a distinction. 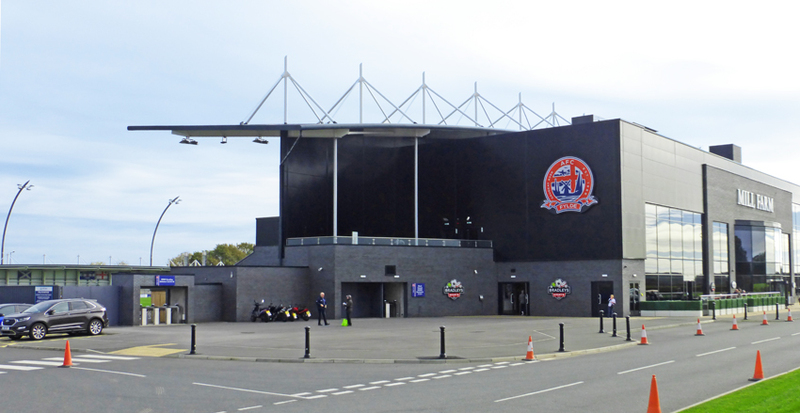 The club’s ground, Mill Farm, is just outside the small towns of Kirkham and Wesham. They are paired on the railway station sign-boards and blend into one another on Station Road. 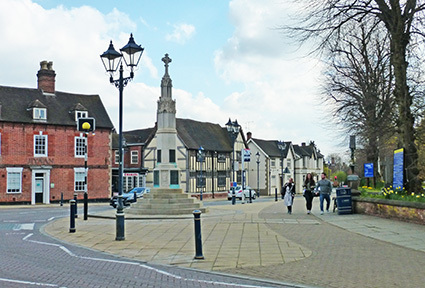 Kirkham, with a population of about 7,200, is about twice as big as Wesham. That does not mean, though, that there’s not much to do or to look at in the vicinity of AFC Fylde. On the contrary: there’s a clue in the name. The Fylde peninsula is a considerable, perhaps notorious tourist hotspot. It’s barely eight miles from Mill Farm to the fleshpots of Blackpool. 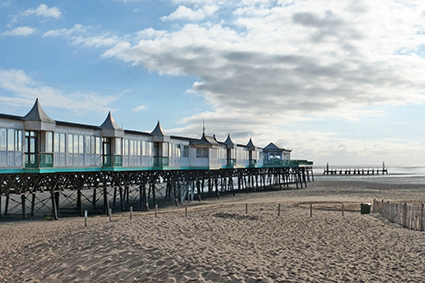 Within about five miles are the more genteel charms of Lytham, and between those two is the middlingly breezy St Annes-on-Sea. Only a mile or two down the road is Wrea Green, where cricket is played during the summer on an authentically English village green, with a fine pub on the corner, and a pond. Lytham has a windmill and associated seasonal Windmill Museum. 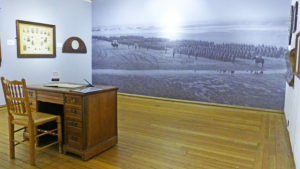 Lytham Heritage Centre holds exhibitions (Lancashire at War, 1914-18, until 9 December), and there’s a small museum at the Old Lytham Lifeboat House. Even closer to Kirkham & Wesham is Wild Discovery, a kind of zoo populated by mainly small but exotic mammals, birds and reptiles, amphibians and insects. It puts on a regular programme of talks and activities, and is more about education and experience than the gawping of a conventional zoo. 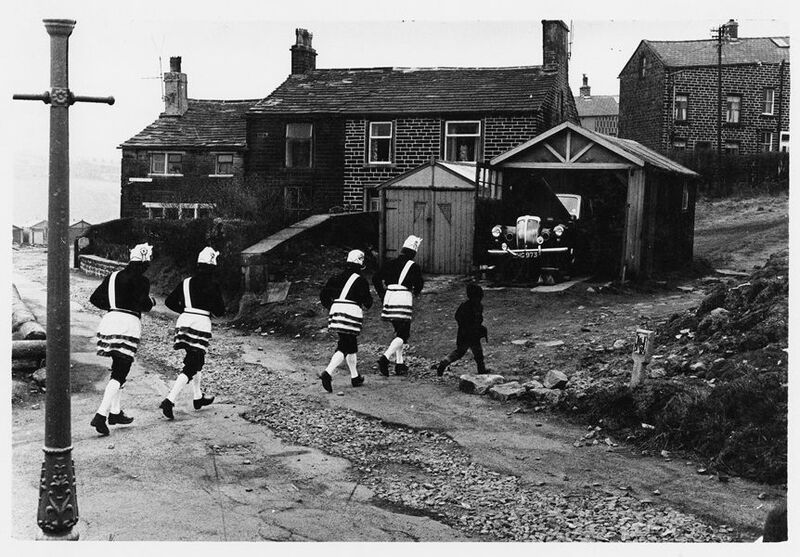 Kirkham itself seems to be the sort of place that was once quite something. At one time it had 11 mills, not to mention a race-course. According to one account it was the first settled place in the Fylde in prehistory, but the evidence – an elk with two harpoons embedded in it – sounds more like Japanese whalers blown seriously off course and having a pop at anything that moved. The town now is notable for small places to stop and watch the world, such as it is, go by. One has a display case containing Kirkham’s last loom. Another records the town’s perennial success in floral competitions, so regular that you’d wonder whether everywhere else has given up. And by the roundabout where the road to Wesham turns off, a leafy arbour suggests the retreat Coronation Street’s scriptwriters have recently discovered to give the characters somewhere to go where they don’t have to be seen boozing or gorging themselves. Wesham has what may be the nation’s last off-licence. The 100th anniversary of Armistice Day is less than a week away. If you’re travelling to a match this weekend, here are some of the places that might be appropriate for a few moments of quiet reflection. There will be displays and events scheduled all over the country. Those below are the ones I’m aware of. Please add any you know of in a Comment and I’ll update the post. Rochdale Touchstones (Leicester U-21 on 6 Nov, Gateshead on 10 Nov). London The Imperial War Museum’s Making a New World is a series of exhibitions, music, performance and public debates. Doncaster The Road to Victory exhibition at Doncaster Museum & Art Gallery follows the fortunes of Yorkshire soldiers. Leeds Goodbye to All That? Legacies of WWI. Manchester Poppies: Wave Wave and Weeping Window are from the original concept by artist Paul Cummins and installation designed by Tom Piper. Leeds There but not There Leeds Minster presents displays and installations around the church. Norwich All Fades to Silence Photography, installation and writing at the Crypt Gallery, Norwich. Colchester War, Art & Reconciliation at the The Minories Galleries. Blackpool, Liverpool (Formby), Sunderland (Roker), Swansea Pages of the Sea Communities will gather on beaches around the country to say Thank You and Goodbye to the men and women who left these shores. London Goodbye to all That at Southwark Playhouse. Manchester Breaking the Silence Alongside Manchester-based music charity Brighter Sound, IWM North will mark 100 years of Remembrance with a sonic performance from young musicians in Manchester; at 11.06am, 12.10pm and 1.10pm. If you know of other events or exhibitions, please leave a Comment and I’ll update the post. While I was putting together Towns of Two Halves I occasionally asked the volunteer attendants about ghosts in the halls and houses where they maintained their vigils. Here, for fans traveling to games on the weekend of 27/28 October, are the places to visit if you want to feel a light chill down your spine. Bradford City fans going to Gillingham: a White Lady frequents the ruins of nearby Rochester Castle. Bristol Rovers fans: Cannon Hall Park, a few miles west of Barnsley, has multiple reports of ghosts. 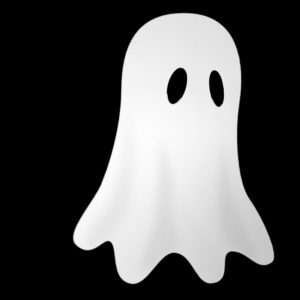 Hull City, at Bolton this weekend: an entire web-page is devoted to the ghosts of Smithills Hall, northwest of the town centre. Oldham Athletic, at Northampton: it was a nightmare last season, but you could ease the pain with a visit to Delapré Abbey to look for the Grey Lady. Swindon Town, at Notts County: the National Justice Museum in Nottingham is said to harbour some uneasy souls. Guilty consciences, probably. This post is compiled from material published and indexed in Towns of Two Halves. Order your copy for £8 +P&P from Amazon to enhance your enjoyment of away games in ways you might never have thought about. Barnsley (for Bristol Rovers) has a Pumpkin Festival at Cannon Hall Farm. In Birmingham (for Sheffield Wednesday at Blues, Blackburn at West Bromwich, Wycombe at Walsall) the options are at Visit Birmingham. Brighton (for Wolves) calls itself “one of the spookiest cities in the country”. For Bristol (Stoke at Bristol City) go to Visit Bristol. Burton (where the visitors are Peterborough): the National Forest Adventure Farm has Screamfest. Cambridge (for Macclesfield Town) has Halloween Tours. Colchester (for Lincoln City fans) has a genuine oddity: in The Cells, there’s the American Horror Lobster dinner. Exeter (for Forest Green Rovers) has Witches & Wizards Tours. For Leeds (where Forest play) family supporters should look at Yorkshire Tots. Liverpool (for Cardiff, and Crawley at Tranmere) pushes the boat out at Visit Liverpool. In London (for Bournemouth at Fulham, Ipswich at Millwall, Villa at QPR on Friday, Luton at AFC Wimbledon) there’s a Halloween Bus Tour among other events. 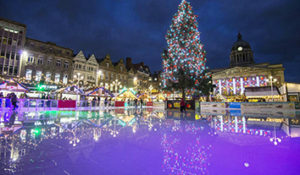 Nottingham (for Swindon at County) has a Mini-fest on the Old Market Square. 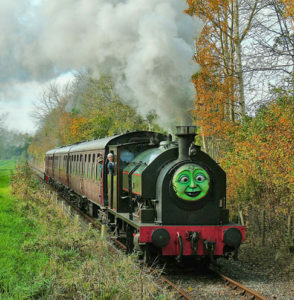 Preston (for Rotherham United fans and steam railway enthusiasts) offers Halloween Spooky Trains on Ribble Steam Railway. Stoke (for Bury at Port Vale) has various things going on at Trentham. Swansea (for Reading fans) has Spooks in the City. Towns of Two Halves might have been written with international breaks in mind. You watch England on the box on Friday night, and then the weekend yawns vacantly in front of you. What are you going to do on Saturday afternoon? How can you get out of going shopping? The answer lies in Football Tourism. It even sounds respectable. All it means is “going somewhere you wouldn’t normally go, to have a look round and watch a match”. It’s up to you how much gawping you do, and where, but you’re sure to find something unusual and you might actually look forward to the next international break. Mancunians have Doncaster Rovers at Rochdale, a town that offers a heritage divi; a little further away, Crewe Alex against Bury should appeal to rail enthusiasts. In Northeast Lancs, ‎Accrington Stanley host Bradford and the Haworth Gallery hosts Europe’s largest collection of Tiffany glass. For Londoners the options are very limited. You probably won’t get into Kingstonians’ snug ground where AFC Wimbledon play Portsmouth, but an afternoon in Kingston is never a bad idea. Go to see where Saxon kings were crowned; admire some wacky street art; enjoy the river. Newport County fly the flag in South Wales, with Stevenage the visitors; allow plenty of time for the Roman camp at Caerleon, the Chartist memorials, the ceramics and the Transporter Bridge. Fans living in East Anglia have a choice. Cambridge United are at home to MK Dons, and the city has more weird and wonderful diversions than you could shake a stick at; Colchester, home to a zoo, Roman history and Twinkle, Twinkle Little Star, will also welcome Crawley Town on Saturday. From the East Riding head south to Scunthorpe for the Peterborough clash and a zoo, a Pink Pig Farm and other attractions. In the fictional South Riding, Barnsley are at home to Luton (noon kick-off); take the kids to Cannon Hall Farm or, in the town centre, Experience Barnsley. In the East Midlands, Burton Albion play Bristol Rovers and you might sniff out the National Brewery Centre. 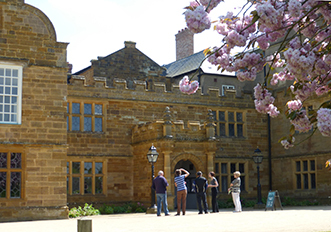 Mansfield’s kick-off against Grimsby is at 1pm, so you will hardly have time for Lord Byron’s gaff, a pit and country park, and a fine local museum. Forest Green are the visitors to Northampton, which has a treat for admirers of Charles Rennie Mackintosh. 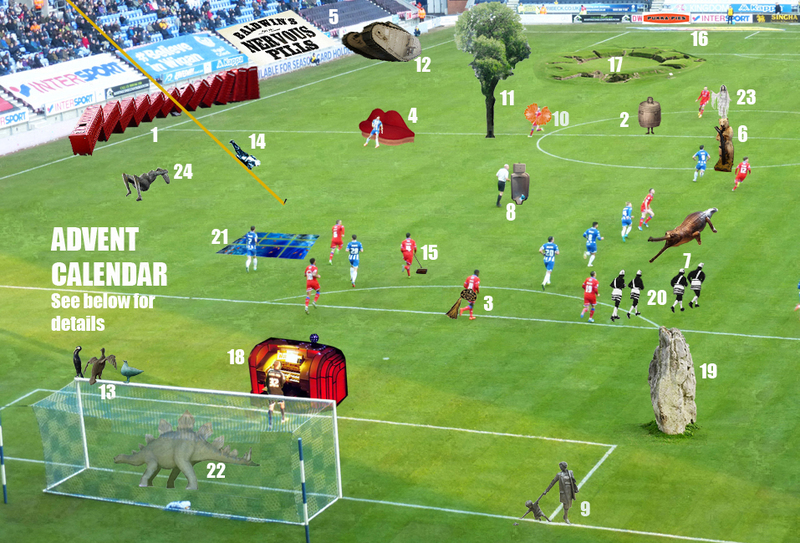 Notts County are at home to Oldham, and Nottingham itself has a variety of alternative attractions, from heritage to video games. In the West Midlands, Coventry City play Wycombe Wanderers; the Cathedral is breathtaking, there’s always something on at the Herbert (a TS Eliot-related exhibition at the moment) and specialist museums cater for musicians and transport enthusiasts. Port Vale, where you can throw in all the Potteries have to offer, play Lincoln. For more details on these and all other football towns, order Towns of Two Halves from info@townsof2halves.co.uk, £8. New England in the Fall isn’t all it’s cracked up to be. If you go a week early – and honestly, how can you know two months ahead of time what the right week will be? – it’s not that much different from Olde England in many respects, of which the colour of the foliage is one. No, the best you can do is to organise an itinerary with variations in latitude and altitude, to give those leaves every chance, book your flights and hotels and hope for the best. If, then, Vermont’s Green Mountains remain doggedly green (as, for that matter, do the White Mountains of New Hampshire) there’s not much you can do about it. 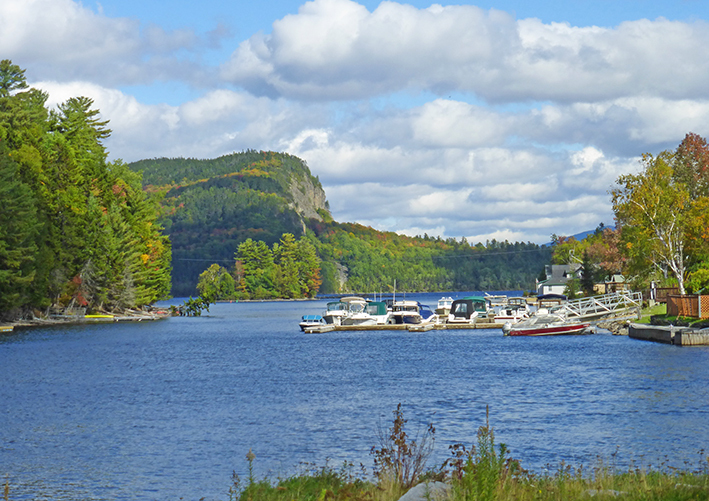 Enjoy the scenery, treat yourself to a long detour to Quebec City, take photographs of covered bridges, waterfalls and lighthouses… and come home with added resolve. Because here too is a way in which travelling to a football match can be a rewarding form of tourism. Woodland Some clubs are surrounded by or adjacent to wooded hills – Forest Green Rovers and the Cotswolds, Wycombe Wanderers in the Chilterns, and several of the northern clubs especially on the eastern side of the Pennines. Nottingham Forest is a significant disappointment in this sense. Arboretums A posh word for ‘park’ really, but the Latin for ‘tree’ should promise some colour at this time of year. 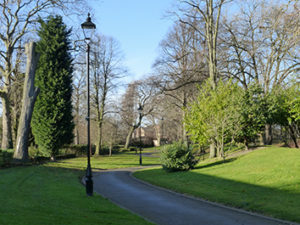 Derby, Lincoln, Nottingham and Walsall have arboretums (arboreta?). 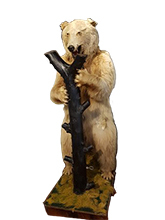 Luton is close to the Chilterns where you’ll find Whipsnade Tree Cathedral just a few miles away. Forest Green, again, is not far from the extraordinary Westonbirt Arboretum. Botanical Gardens Kew is next door to Brentford. 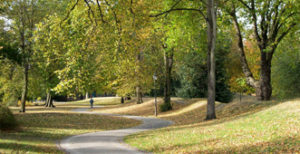 In other places, the botanical gardens are a little further away from the football grounds – Birmingham, Bristol, Cambridge, Leicester, Oxford and Shefffield. Norwich’s Plantation Garden is a special place, worth a mention and worth a visit. Parks Many football teams play at Parks. The most promising name here must be Blackburn Rovers’ Ewood Park, but it might as well be called EByGum Park for all the wood involved. Some clubs, however, play in or adjacent to functioning parks: Aston Villa, Bournemouth, Fulham, and Plymouth for example. Parkland This is subtly different. 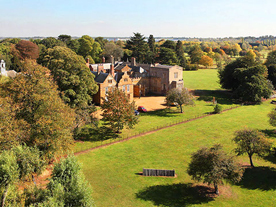 Parkland belongs to country houses. So Barnsley has Cannon Hall, Mansfield has Newstead Abbey and Northampton has Delapré (as well as the excellent Abington Park, which belongs in the previous category). This is compiled from information recorded and indexed in Towns of Two Halves. Order your copy for from info@townsof2halves.co.uk £8 to enhance your enjoyment of away games in ways you might never have thought about. Welcome to the website of Towns of Two Halves, the new book and online back-up that will transform football fans’ enjoyment of away games by turning them into tourism.